Finish It Up Friday ~ Gee’s Geese! I wanted to finish this before I left for AZ and I made it! I really love how this turned out. The first pictures here are before washing. My blocks finish at 3 by 6 inches and the quilt is approximately 54 by 69 inches. I used Cool grey Glide thread in the top and bobbin. I used a bleached muslin for the back. The lines of quilting are about every half inch. I clearly wasn’t worried about perfection! I also lost a few points in the binding at the top and sides. I care not! Since these fabrics are hand dyed, I was warned in the accompanying pattern (that I did not use), that there was a good chance the colors would run when washed. I had heard from several people who had used similar kits that they had this issue. So it was a rather bold move on my part to use a white backing fabric. What can I say? I was in a hurry to get it on the frame! I washed it on cold with the only color catcher I had left. I can tell that the fabrics bled at all. The color catcher was only slightly discolored. The white backing is still white. I guess it was my lucky day! Oh, how I love that texture! 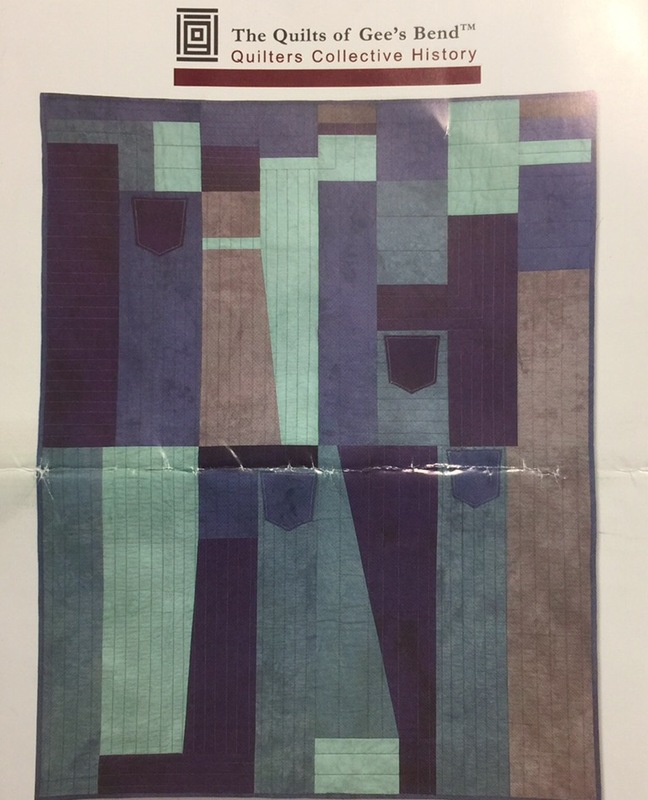 As a reminder, this is the pattern that came with the fabric in the kit. I like mine much better! This entry was posted in Finishes, Hand Dyed Fabric, Uncategorized. Bookmark the permalink. 39 Responses to Finish It Up Friday ~ Gee’s Geese! This is awesome! Love the quilting too. 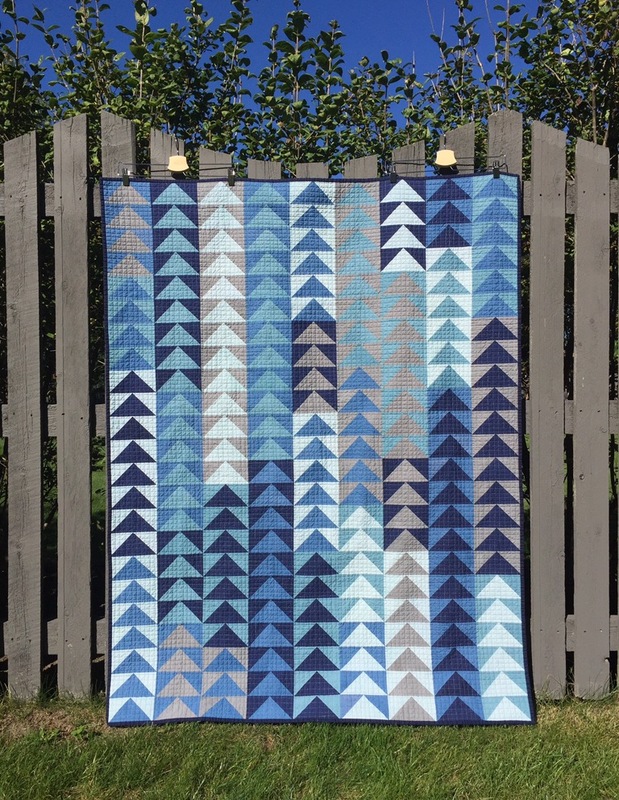 I love the blues and greys together in this quilt, Katy. The quilting is interesting because in the photo it gives the effect of a plaid (to me, at least). Well done! I love your version! nd the quilting is just perfect for it – what a great quilt!! Beautiful. It’s such a striking quilt. Kudos on the finish. 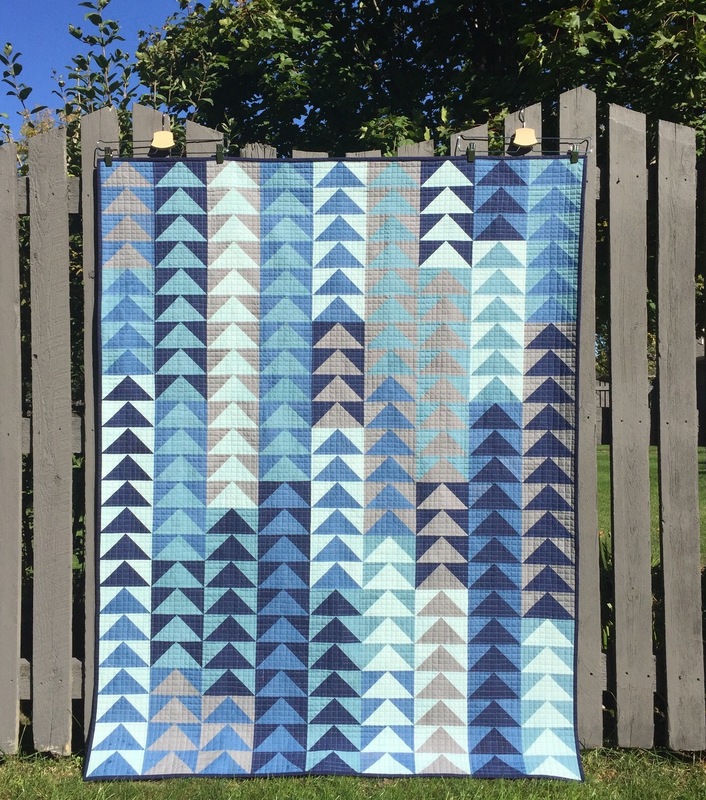 I love this quilt, the colors are perfect for geese. Great job piecing and quilting. katie, katie, katie, katie, katie….and one more katie…you did a fine job girl! Your quilt and quilting is so beautiful!! Much better than the pattern!!! Love the colors!! It’s WONDERFUL, Katy! I love that you’re not afraid to think outside the box. This one worked out better than the pattern the fabrics can with. It’s gorgeous, Katy! 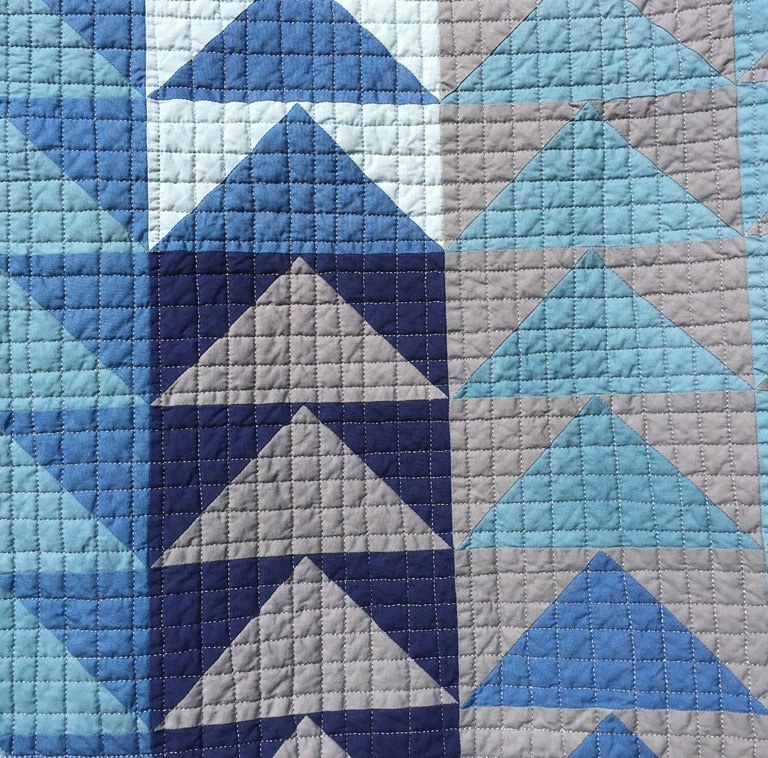 I love all those blues and the quilting texture is perfect. Fabulous quilt. 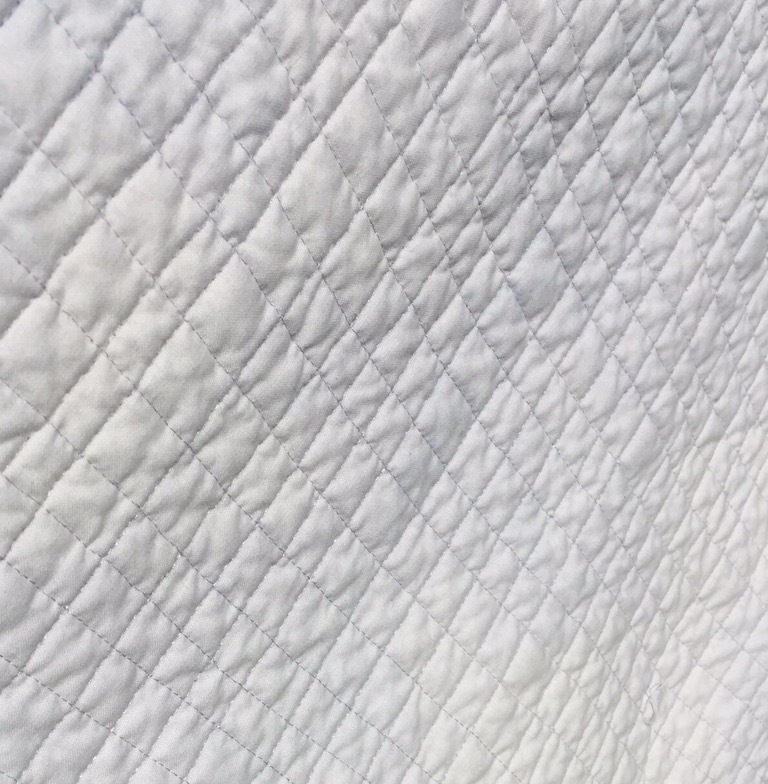 Geese are flying in formation, and your quilting adds to the charm. WOW! What a beauty! Love the texture from the grid quilting too! Katy I really love this quilt. I’ve got the Accuquilt die for flying geese and want to make one. You are an inspiration. Hugs. 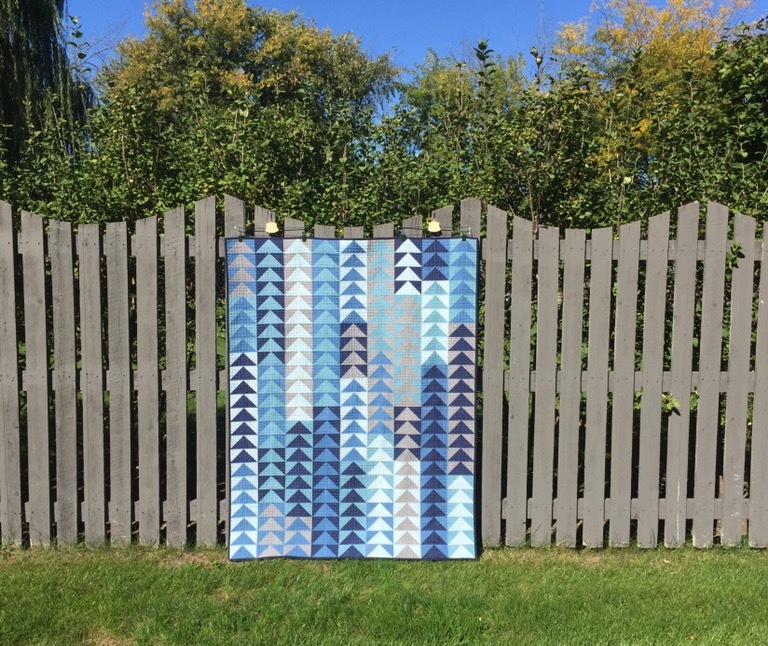 It’s a beautiful quilt and it looks just stunning against the grey fence with the blue, blue sky in the background. You have made an incredible work Katy ! Congratulations for this gorgeous quilt ! Gorgeous quilt and love the cross hatching! Yours is WAY better. Gorgeous, Katy! I, too, prefer your Gee’s Geese to the suggested pattern. Do you find that straight line quilting goes a bit faster than a panto? Oh my, what a beautiful piece of artwork. I LOVE the effect of the small square quilting. It really was the right pattern for quilt. I like the quilt you made much better than the pattern. I also like yours better. What’s not to love? And so lucky on the washing!! I like yours much better too. Color catchers work wonderfully! Yay to no bleeding! I like yours much better too! It turned out gorgeous. The colors and the quilting is perfect. I’m so glad it didn’t bleed, that could have been a disaster! I love it and glad you finished it before heading to Arizona! How many projects to take are you at now?! Katy, this quilt is amazing!! The colors are great, and I love the flying geese (it is one of my favorite quilt block patterns!) ….your arrangement of the colors pulls everything together so well and I love the grid quilting. So glad there was no bleeding of color in washing!! Thanks for letting us follow along in the making of this quilt!!! Just a joy to see your projects! Incredible what you did with that kit! I would not have considered it at all by looking at that photo. Great job all around. fabulous quilt~! love all that texture! I absolutely love it!!! Much better than the pattern in the kit!! It’s gorgeous!! The quilting just finishes it beautifully!! I like this quilt a lot!!! You have the touch fir sure! My favorite quilt of yours. Everything really works on this one. 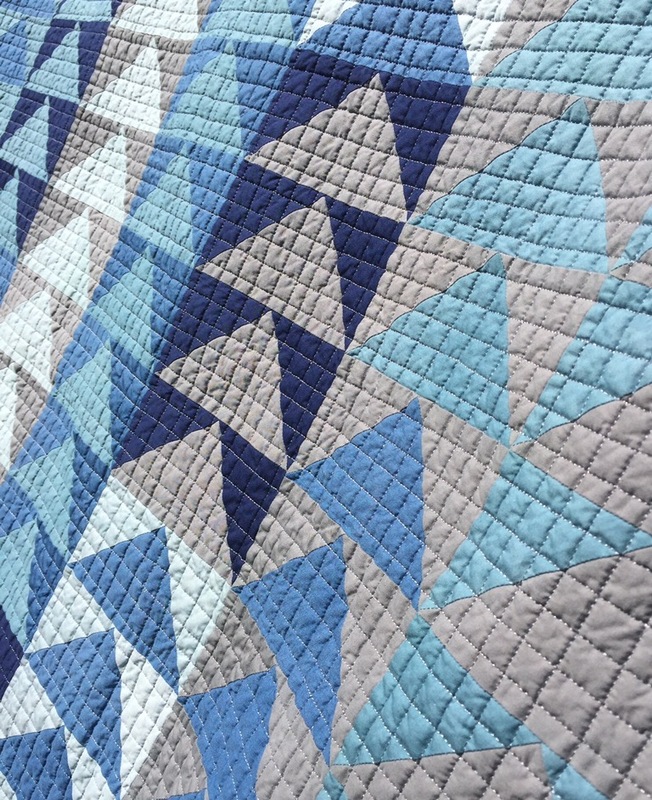 The colors are calming, the geese are graphic, and the quilting is just fun and I can’t wait to try that myself. I am awed by your focus and appreciate you sharing your work. Hurray! Your quilt is stunning! Definitely much more my taste than the pattern. The palette is beautiful and your layout is well-balanced. 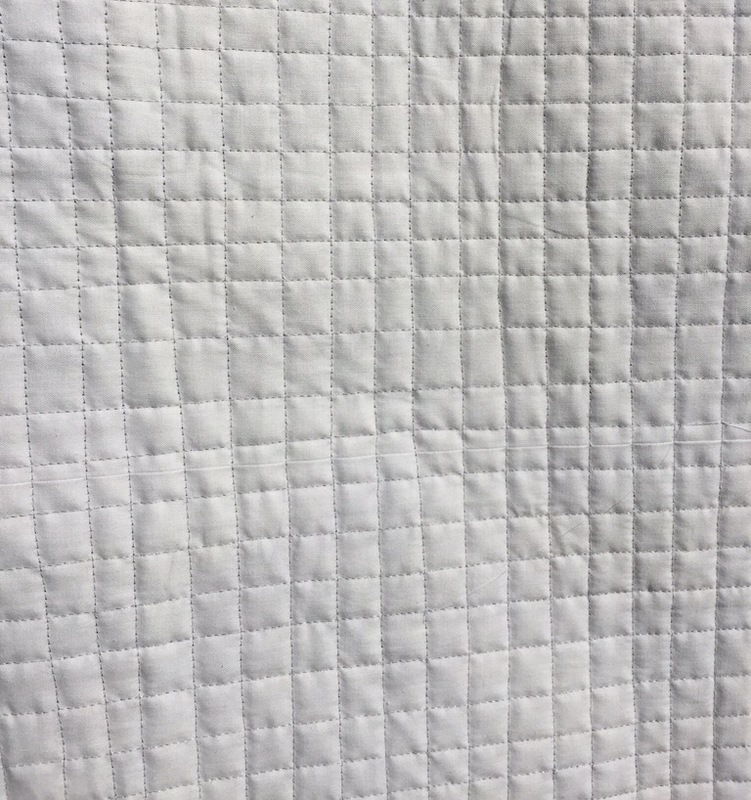 I love your small-grid quilting, it adds great texture! Katy, your quilt is a much more stunning use of those fabrics. Also, many thanks for your tutorial on the fabulous quilting. You should be well pleased with the results. Cheers. Bronwyn. I love everything about your quilt. 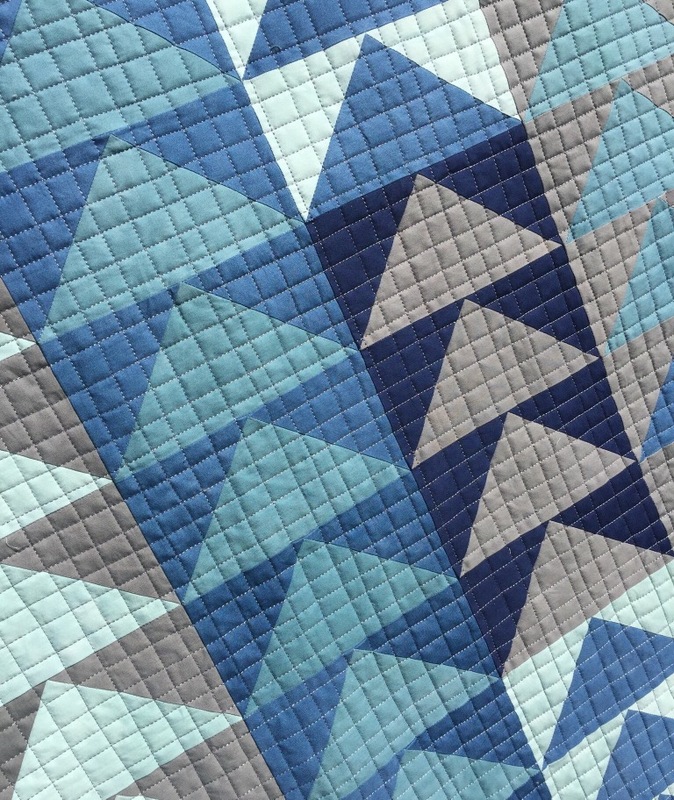 Your pattern choice, the colors and the quilting are just right for each other. Great job! That is a large flock of geese 🙂 I like the colour combination and you are absolutely right, your pattern is way better!